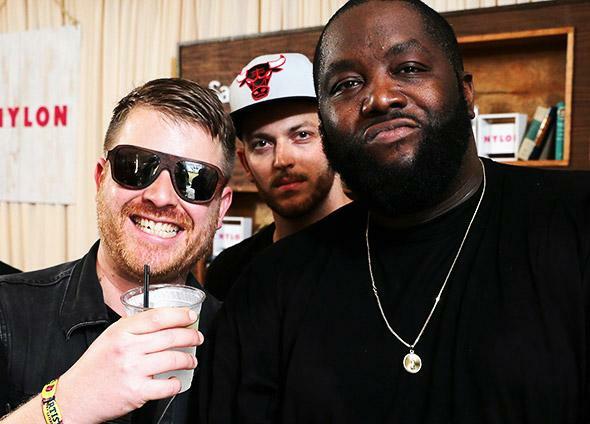 Best rap album of 2014: Run the Jewels 2? The safe choice, but that doesn’t make it wrong. Entry 16: RTJ 2 may be the safe choice for rap album of the year, but that doesn’t make it wrong. I appreciate the correctives Lindsay and Jon offer. Critics are certainly prone to hypocrisy, especially this time of year, when we’re scrambling to impress each other with our sorting skills. Those of us who value the generalist position do sometimes set aside our personal preferences in favor of a regimen of musical multivitamins that can feel, to us and our readers, lacking in real flavor. But let me speak up for genuine eclecticism, too. Critics who sample and critique music widely for daily newspapers (some still exist, though even Jon’s Grey Lady has recently caught a wicked cold) or other general publications need to expose their audience to multifarious options. If many settled on Run the Jewels 2 as the hip-hop album of the year, that’s led to thousands of new ears potentially hearing that album, and I can’t see how that’s a bad thing. I put it on my list after thinking hard about how it would look: As someone who mostly squeezed in hip-hop in moments of leisure this year, I knew I’d look like exactly what “real” hip-hop lovers scorn. But you know what? I did spend time with Rae Sremmurd, who get a ton of radio play in my home state of Alabama; and OG Maco, my Vine-addicted kid’s fave; and the Black Portland mixtape, which got me through some long drives into Georgia; and YG, who reminds me of Los Angeles, a former home of mine that I miss every day. I hear intricacies, strengths, and silliness in all of them. But RTJ2 just hits harder. Its tracks benefit from all kinds of stodgy values: experience, and focus, and seriousness, and a commitment to making meaning accessible. What do you do when the safe choice is the right choice? I say, make it. Because if some 40-year-old high school science teacher who comes to my list to discover mostly singer-songwriters (my bliss) takes a risk on Killer Mike and El-P, her life will be enriched. And so will the artists’ pocketbooks: Yesterday I saw a YouTube ad for RTJ2 that featured, in giant letters against a red background, the name of every list the album has topped, along with images of Mike and El-P leaning back and loving it. This is something I thought about a lot in 2014: The musicians whose efforts have made my life so meaningful exist in the real world of money, and physical limitations, and ambitions scaled to the size of a four-week tour. I watched a couple young bands I’d discovered when they were still regional faves break through to a national audience, and it’s been exhilarating to see them come into their own. The first time I saw Alabama’s own St. Paul and the Broken Bones perform live, it was at the tiny Green Bar in my hometown of Tuscaloosa, to maybe 75 people. A year later, they sold out one of Birmingham’s biggest rooms, Workplay, and that night was better than any Grammy party or MTV awards show I’ve ever been to. Paul Janeway, who’d been working in a bank just months before, sang his guts out as he anointed fans in the crowd with handshakes. The horn section, recent Samford University grads, emanated the joy of young men just then realizing they wouldn’t have to become pharmacists after all. Browan Lollar, the gifted guitarist who’d made an earlier mark as part of Jason Isbell’s band, played off Janeway’s moves as if they were the nerdy equivalent of the Glimmer Twins. Standing stage right, I could feel these real people hitting their marks, and the fans who’d supported them along the way joining in the circle of satisfaction. This was music as community, a corny idea that’s as relevant as blood’s circulation when it’s manifest. My emotional attachment to St. Paul, or to bands like Hurray for the Riff Raff or songwriters like Robert Ellis, would have been inconceivable to me when I was a critic working in New York 15 years ago. Though I don’t have them over for holidays, I’d call any of these artists friends—especially now that I share birthdays and mood swings with hundreds of friends online every day. When I was younger, critical distance was not only a value I upheld; it was a fetish to which I clung. My peers were other writers; I mostly encountered musicians under the artificial light of assigned interviews or as a member of the crowd, standing notebook in hand two-thirds of the way back in the club. There’s value in this stance; it combats nepotism. But I’ve come to believe that the isolated critic misses major elements of what makes music live in the world: the craft of it as it unfolds in endless hours of practice and compositions attempted and trashed; the web it weaves within communities of players and supporters who help each other arrange gigs and find places to stay and promote those gigs and not become addicted to stuff and survive health problems and heartbreaks; the magic of it when, risking something new in front of a friendly crowd, an artist surprises herself and delight sweeps over all of us like fireglow. Living in smaller scenes—Seattle, then Northeast Los Angeles, now a South that for me extends north to Nashville and down to New Orleans—I’m reminded every day of how many different kinds of brilliant folk make up a music scene. She makes the posters. He found a great all-ages space. They cooked breakfast for the crowd. They played their guitars, or spun rhymes. We’re all in this together. It’s been ever thus, and having grown up in indie America I’ve seen the cross-country support system (the good thing about Sonic Highways was that it highlighted such networks; the bad thing, as Julianne Escobedo Shepherd piquantly observed, was that it erased women and people of color from the picture) go through several generational shifts. It’s more relevant than ever. Lindsay’s observation that she discovered her favorite album of 2014 on Bandcamp reveals how virtual and real encounters merge to bring an artist into the light of a sustainable career: a listener finds her in the ether, and sends a gossamer PayPal thread that materializes into cold, hard cash that funds a tour, or a recording. Objectivity was already a myth, but Kickstarter killed it dead. Musicians are sending handmade gifts to the fans who help them, welcoming them into the studio, performing at their houses. It’s tough to stay totally cool over the barbecue pit in the backyard. I surveyed some friends about their favorite crowdfunded projects from 2014, and the breadth of both the music offered and the way those funding campaigns augmented it was inspiring. Drive-by Truckers keyboardist Jay Gonzalez wanted to record a pop song cycle called “The Bitter Suite,” so he offered investors a music lesson or a song written especially for them. Portland “geek girl” duo the Doubleclicks not only wanted to make a new album, they hoped to revive their ongoing project of making a video per week and putting it on YouTube. They gave supporters gamer dice and handcrafted stuffed dinosaurs. Veteran multi-instrumentalist Paul Raymond celebrated 50 years in the music biz with a Pledgemusic.com campaign; who wouldn’t want to spend a few bucks to get a Christmas card from one of the guys in UFO? The extraordinary gospel singer Mike Farris paid for his latest efforts by giving people signature black hats and musical wake-up calls. I know that musicians sometimes resent having to hustle the Kickstarter way. But I think all the clever incentivizing helps fans remember that music is part of the whole weave of a life, and of the world. And that’s where I want to live and write from: a place vivid and warm with interconnection, where the artistry of the extra-blessed complements the creativity of others who find their way and do their part. Call me a hippie. But I think I’m riding a wave here. Let’s see where it all takes us in a year. In the meantime, thanks for your smarts and your hearts, Team Club.